SNES Disney's Aladdin (USA) "all gems" in 16:13.62 by Jaysmad. 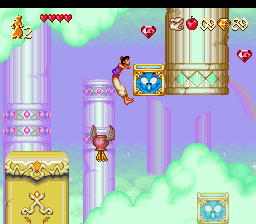 Unlike in the other movie of this game, Jasmine wasn't happy with just being rescued by Aladdin; she made him spend a little time picking up some jewelry for her on the way. This movie aims to complete the game with all the red gems collected, which takes a little more time, but adds quite a bit to the entertainment value of the run. The core trick of this TAS is to abuse the parachute extensively to move faster than normal walking or jumping.